Seahawks QB Russell Wilson has orchestrated 19 game-winning drives, the most by any player in NFL history after the first 75 games of a career. After snatching a game-winning, two-yard touchdown pass from Russell Wilson Sunday with 31 seconds remaining, WR Doug Baldwin summed up his quarterback in a mere nine words: “He has shown a propensity to do miraculous things.” Aside from the fact that Baldwin might be the first wideout in NFL history to use “propensity” in a sentence, some might describe his words as hyperbole. They are not. The 14-play, 75-yard drive that Wilson orchestrated over the final four minutes, ending with the Baldwin touchdown on second-and-goal, marked the 19th game-winning march of Wilson’s five-year career. 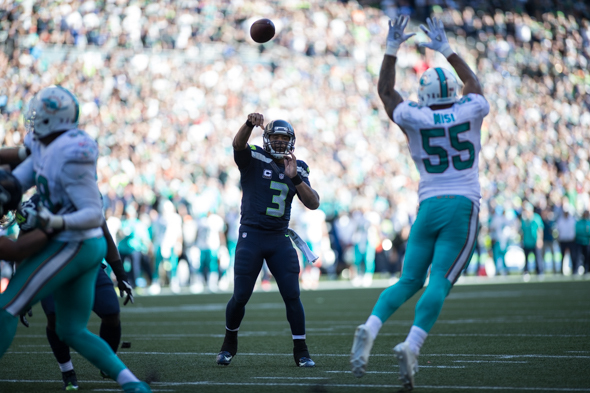 It lifted the Seahawks to a 12-10 victory over the Miami Dolphins that was a lot tougher for Seattle than bookmakers figured it would be. Wilson is within one game-winning drive of tying the franchise record of 20, held jointly by Dave Krieg (1983-91) and Matt Hasselbeck (2001-10). Krieg set the mark over 136 games (regular season and playoffs) and Hasselbeck matched it in 149. Wilson played in his 75th game Sunday. Among the many records held by Peyton Manning is the one for most game-winning drives. Manning orchestrated 56 over 18 seasons with the Indianapolis Colts and Denver Broncos. Hall of Famer Dan Marino had 51 and Tom Brady has 48. Six of the top 10 leaders in game-winning drives are in the Hall of Fame and the other four – Manning, Brady, Drew Brees and Ben Roethlisberger – are enshrinement locks when they become eligible. Since Wilson entered the NFL in 2012, his 19 game-winning drives have occurred in the fourth quarter (Tony Romo has 16 and Andrew Luck 14). With Wilson’s fade route to Baldwin Sunday, nine of the 19 ended with Wilson touchdown passes. Three have come inside the final minute, including the most controversial, a 24-yarder to Golden Tate Sept. 24, 2012 with 0:00 showing on the Clink clock. That play quickly entered pro football lore as the “Fail Mary.” Wilson also tossed a 23-yard game winner with 47 seconds to play to TE Luke Willson to defeat Carolina Oct. 26, 2014. Wilson’s longest game-winning TD, 46 yards, went to WR Sidney Rice Oct. 14, 2012, defeating the New England Patriots 24-23 at CenturyLink Field with 1:18 remaining. Wilson and Rice also beat the Chicago Bears at Soldier Field Dec. 2, 2012 by collaborating on a 13-yard TD with 7:33 left in OT. Surely the most dramatic of Wilson’s game-winning drives was the one that ended with his 35-yard perfecto to WR Jermaine Kearse with 11:41 left in overtime Jan. 18, 2015 that beat Green Bay 28-22 and claim a spot in Super Bowl XLIX. Even after 75 games, some NFL watchers – columnist Pete Prisco of CBSSports.com is a prime example – still consider Wilson a glorified game manager. But glorified game managers do not conduct 19 winning drives in the first 75 games of a career. This “Glorified Game Manager” I watched him play with enough tape to reach Seattle from my home in Silverdale that immobilized his feet, gutted out a game winning touchdown. That’s focus and poise not management. Also that safety was at the half second to play why didn’t the zebras give us the score and credit?? GO HAWKS!! It wasn’t a safety. The QB was hit 1-2 yards outside the end zone and the *tackler*’s momentum carried them into the end zone. Had the clock not run out, the ball would have been placed at about the 1 1/2 yard line. The clock was irrelevant to whether it was a safety or not. Can’t hurt to whine a bit, eh? Still a great finish for the first of the season, GO HAWKS!! The sack of Tannehill began beyond the end zone. He gets credit for forward progress. No safety. Though I am impressed by RW’s stat, one must also admit most of these QB’s jumped on the competition early and didn’t need to come back to win. A closer look at their record is needed Steve. Let’s remember the Seahawks have been woeful on offense, overall, while most of these QB’s headed up offensive machines. RW heads up a DEFENSIVE machine. Actually, your point makes Steve’s research more relevant. Wilson has been getting wins late out of offenses that haven’t had heavy investment. Not to mention, these are the guys with THE MOST COME FROM BEHIND VICTORIES. Making your point irrelevant. No one else has more come from behind victories than these guys. RW also has more WINS than any of these guys through 75 games as well. The percentage of victories to come from behind victories is likely to be similar. “RW heads up a DEFENSIVE machine”, as you say, that gets him the ball back and limits scoring in the first place. You could argue that a QB that didn’t play with good defenses or good coaching (Manning) would have had a harder time launching those comebacks. More impressive is Wilson’s streak of games dating back to his Freshman year at NC State (broken last year finally) of always being within 1 score in the fourth qtr. That makes these comebacks make sense. He’s always in the game. I’d forgotten about that. Thanks. Wisconsin at MSU in 2011: Wilson brings them back from two scores down in the fourth qtr to tie the game with less than two minutes left. Kirk Cousins (with an assist from an idiotic time out by UW coach Bret Bielima) takes MSU to the 50 yd line and heaves one that was caught outside the endzone, and appeared short, but was overturned on reply, giving Wisconsin the loss. Wisconsin vs Ohio State (the next week): Wilson brings UW back from two scores down AGAIN in the 4th qtr to take the lead with less than two minutes left. Ohio State is left with a desperation heave after a Wilson-like scramble by Redshirt Freshman QB Braxton Miller. Who connects as time expires, from 41 yards out. Seattle at Atlanta, 2012 NFL Divisional Rd: Wilson brings the Seahawks back from 3 scores down in the fourth qtr to take the lead with less than 30 seconds to play. Two plays later, the Falcons kick a game winning field goal. That has got to be the second most devastating loss of Wilson’s career. He may even say he would take the Super Bowl INT loss over that one, since at least in the Super Bowl, he lost it on the field.